Hosts are amazing. Beach is just two minutes away, walking distance. Marcos and Petros were the most welcoming and generous hosts that we have ever encountered. They went above and beyond to make our stay comfortable and enjoyable. Great place to stay to avoid the crowds- just a few minutes walk to the black sand beach of Perissa. We rented a car and were able to navigate the island easily. This apartment was perfect for us. It was clean, cozy, and maintained well. It had a washing machine and line dryer which was very helpful, as the black sand beach is just a few minutes walk down the road. The owners made our stay so pleasant and relaxing. They are very knowledgeable about the local restaurants and buses. The property is quite new and well maintained. The apartments are plenty big with laundry and a full kitchen. The hosts, Markos and Petros, were very kind, accommodating and helpful, even leaving a basket of treats for us. They were also very sweet to our son and gave him a nice gift. Location was just a few minutes walk from the beach and lots of restaurants, shops and ATV, scooter and car rentals. The air conditioning worked great to keep the inside cool during the really hot days. The property is beautiful and clean. 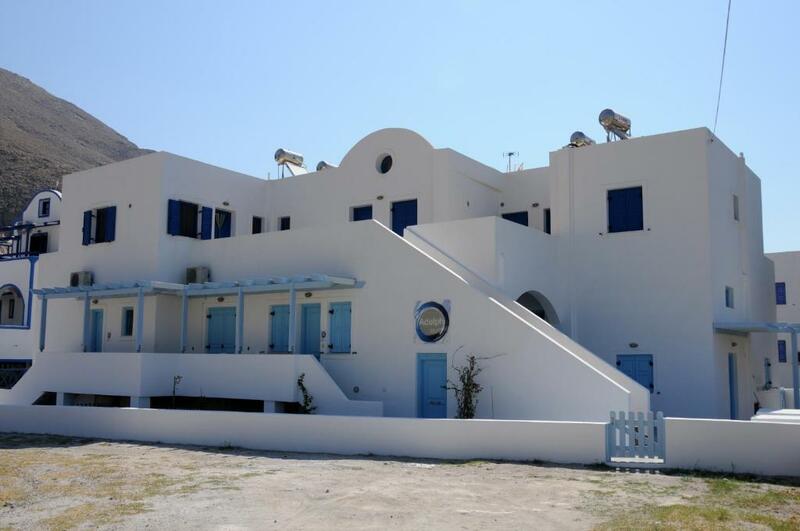 It is in good location near famous Perissa Beach . Our group really enjoy our stay in Santorini as Pedros and Markos provide us excellent customer service. They provide us free transfer and gave us gift basket on first day. At the end of our stay they also give us hand made souvenir. Thank you for taking care of our group and make us feel like at home. Amazing place! Amazing people! They are the first and the best Greek people I ever met in my life. Very Impressive Santorinian hospitality experience. Everything is just two sums up! Definitely, I'll be back sooner or later for next holiday. Many thanks for Marcos & Petros. We loved that Adelphi was only a short walk to the beach and restaurants and bars (and a great bakery), but far enough away that we had plenty of peace and quiet in the evening. We had a 1 bedroom which thoughtfully came with water, coffee, some beers in the fridge and a nice basket of things provided by our hosts, Markos and Petros, who were both a delight. There was plenty of space for the two of us and the place was absolutely immaculate. The location is not far from the track up to Ancient Thira and beyond. We hiked up there several times. If it weren't for our flight back home, we would have stayed longer. Santorini is not big and we made it all over the island and we didn't really run across anything that we thought would have worked out better for us. Place is good esp the location. Marcus and Petros were so kind and accommodating to us. Everything worked perfectly fine! Particular attention from the hosts was extremely pleasant and smoothened every aspect of our stay. I definitely recommend it! Lock in a great price for Adelphi Apartments – rated 9.9 by recent guests! One of our best sellers in Perissa! Located in Perissa, Adelphi Apartments provides accommodations with free WiFi, a seating area, a flat-screen TV and a kitchen. Each unit comes with an oven, toaster, a coffee machine, as well as a fridge and electric tea pot. Some units include a dining area and/or a terrace. Ancient Thera is a 10-minute walk from the apartment. Santorini International Airport is 8 miles away. 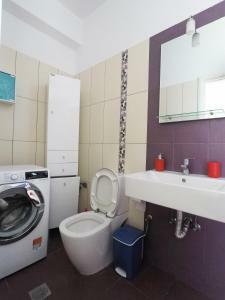 뀐 Located in the top-rated area in Perissa, this property has an excellent location score of 9.6! When would you like to stay at Adelphi Apartments? This apartment has a dishwasher, tea/coffee maker and kitchen. 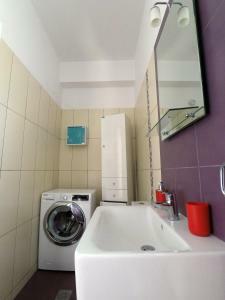 This apartment features a washing machine, electric kettle and air conditioning. This apartment features a private entrance, tea/coffee maker and kitchen. Καλώς ηρθατε στα Διαμερίσματα "Αδέλφι". Με μότο/φιλοσοφία "Κατι περισσότερο από ευπρόσδεκτοι", ο ιδιοκτήτης και το managment των διαμερισμάτων, έχουν σαν κύριο στόχο να μεταρέψουν τα διαμερίσματα ανετα και φιλικά όπως το σπίτι σας. House Rules Adelphi Apartments takes special requests – add in the next step! Adelphi Apartments accepts these cards and reserves the right to temporarily hold an amount prior to arrival. The hosts at the property were exceptional. They anticipated our needs and went beyond. I would highly recommend a stay at this establishment. I can't say enough good things about Petros and Marcos. We will return without a doubt. Excellent stay in a well equipped, clean and comfortable apartment. Location is also within walking distance to the black sand beach. Gracious and hospitable host by Pedro and his assistant, Marco. Our hosts were extremely kind, they recommended us several intresting places to visit. Beyond that they prepared some very kind and heartwarming little suprises, for example sweetes, which we loved. The apartment was cleaned by our hosts every day, which made our stay very comfortable. We would definitely recommend Adelphi Apartments. Santorini is a quite expensive island crowded with tourists in August. Fortunatly owners provided advices for nice and good restaurant and visits. Very clean appartment. Bedrooms are large and confortable.Appartment is very close to beaches (clear waters with big fishes). Tv with satellite! Owners very nice (they kept offering small presents!!). The owners are extremely friendly. They made us feel at home. We higly recommend booking at adelphi apartments if you are planning a trip to Perissa. The position is pefect both if you just want to enjoy the seaside or if you are even planning to rent a car to discover the beauties of Santorini. We really had a great time at adelphi apartments!